Fish, frogs, reptiles, birds and mammals are called vertebrates, a name that comes from the bony column of vertebrae (the spine) that supports the body and head. The rest of the skeleton of all these animals (except the fish) also has the same basic design with a skull that houses and protects the brain and sense organs and ribs that protect the heart and lungs and, in mammals, make breathing possible. Each of the four limbs is made to the same basic pattern. It is joined to the spine by means of a flat, broad bone called a girdle and consists of one long upper bone, two long lower bones, several smaller bones in the wrist or ankle and five digits (see diagrams 6.1 18,19 and 20). 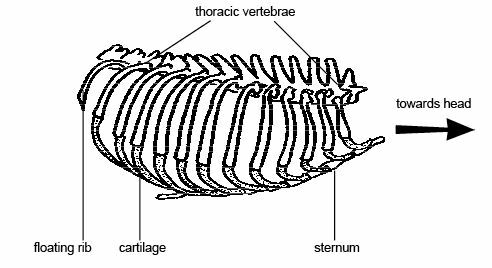 The vertebral column consists of a series of bones called vertebrae linked together to form a flexible column with the skull at one end and the tail at the other. Each vertebra consists of a ring of bone with spines (spinous process) protruding dorsally from it. The spinal cord passes through the hole in the middle and muscles attach to the spines making movement of the body possible (see diagram 6.2). The shape and size of the vertebrae of mammals vary from the neck to the tail. In the neck there are cervical vertebrae with the two top ones, the atlas and axis, being specialized to support the head and allow it to nod “Yes” and shake “No”. Thoracic vertebrae in the chest region have special surfaces against which the ribs move during breathing. Grazing animals like cows and giraffes that have to support weighty heads on long necks have extra large spines on their cervical and thoracic vertebrae for muscles to attach to. Lumbar vertebrae in the loin region are usually large strong vertebrae with prominent spines for the attachment of the large muscles of the lower back. The sacral vertebrae are usually fused into one solid bone called the sacrum that sits within the pelvic girdle. 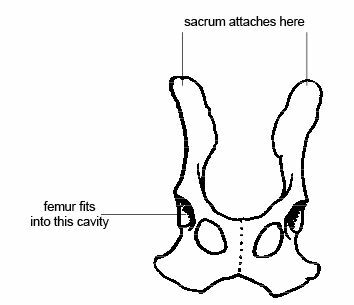 Finally there are a variable number of small bones in the tail called the coccygeal vertebrae (see diagram 6.3). The skull of mammals consists of 30 separate bones that grow together during development to form a solid case protecting the brain and sense organs. The “box “enclosing and protecting the brain is called the cranium (see diagram 6.4). The bony wall of the cranium encloses the middle and inner ears, protects the organs of smell in the nasal cavity and the eyes in sockets known as orbits. 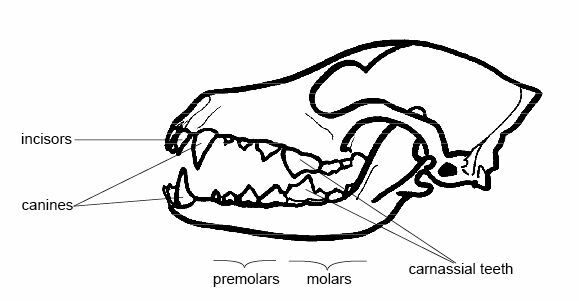 The teeth are inserted into the upper and lower jaws (see Chapter 5 for more on teeth) The lower jaw is known as the mandible. It forms a joint with the skull moved by strong muscles that allow an animal to chew. At the front of the skull is the nasal cavity, separated from the mouth by a plate of bone called the palate. Behind the nasal cavity and connecting with it are the sinuses. These are air spaces in the bones of the skull which help keep the skull as light as possible. At the base of the cranium is the foramen magnum, translated as “big hole”, through which the spinal cord passes. On either side of this are two small, smooth rounded knobs or condyles that articulate (move against) the first or Atlas vertebra. The hind limbs have a similar basic pattern to the forelimb. 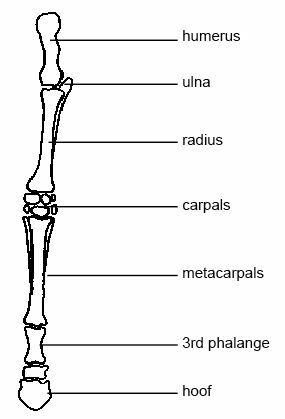 They consist of: femur, tibia and fibula, tarsals, metatarsals, digits or phalanges (see diagram 6.7). The top of the femur moves against (articulates with) the pelvis at the hip joint. The girdles pass on the “push” produced by the limbs to the body. The shoulder girdle or scapula is a triangle of bone surrounded by the muscles of the back but not connected directly to the spine (see diagram 6.1). This arrangement helps it to cushion the body when landing after a leap and gives the forelimbs the flexibility to manipulate food or strike at prey. 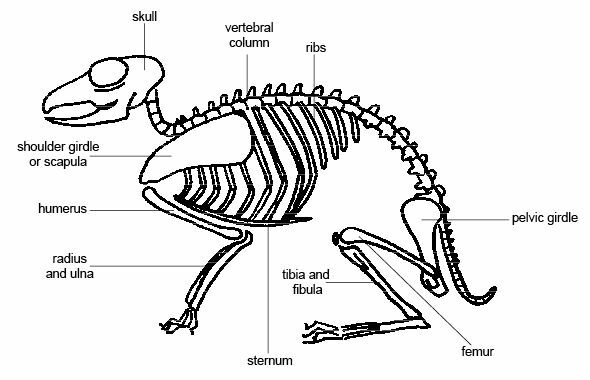 Animals that use their forelimbs for grasping, burrowing or climbing have a well-developed clavicle or collar bone. This connects the shoulder girdle to the sternum. 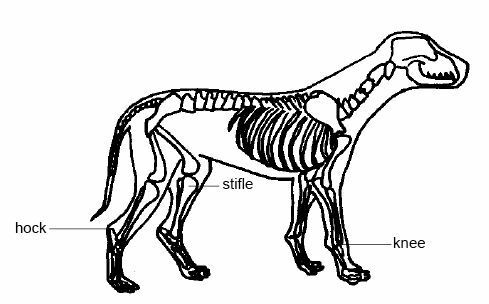 Animals like sheep, horses and cows that use their forelimbs only for supporting the body and locomotion have no clavicle. The pelvic girdle or hipbone attaches the sacrum and the hind legs. It transmits the force of the leg-thrust in walking or jumping directly to the spine (see diagram 6.10). 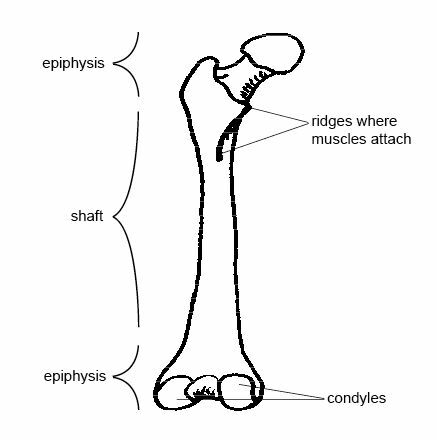 A long bone consists of a central portion or shaft and two ends called epiphyses (see diagram 6.12). Long bones move against or articulate with other bones at joints and their ends have flattened surfaces and rounded protuberances (condyles) to make this possible. If you carefully examine a long bone you may also see raised or rough surfaces. This is where the muscles that move the bones are attached. You will also see holes (a hole is called a foramen) in the bone. Blood vessels and nerves pass into the bone through these. You may also be able to see a fine line at each end of the bone. This is called the growth plate or epiphyseal line and marks the place where increase in length of the bone occurred (see diagram 6.16). If you cut a long bone lengthways you will see it consists of a hollow cylinder (see diagram 6.13). The outer shell is covered by a tough fibrous sheath to which the tendons are attached. Under this is a layer of hard, dense compact bone (see below). This gives the bone its strength. The central cavity contains fatty yellow marrow, an important energy store for the body, and the ends are made from honeycomb-like bony material called spongy bone (see box below). 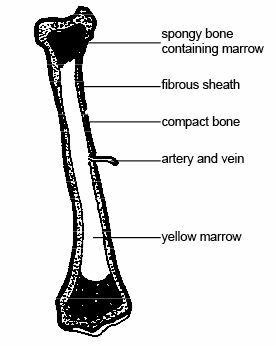 Spongy bone contains red marrow where red blood cells are made. Compact bone is not the lifeless material it may appear at first glance. It is a living dynamic tissue with blood vessels, nerves and living cells that continually rebuild and reshape the bone structure as a result of the stresses, bends and breaks it experiences. Compact bone is composed of microscopic hollow cylinders that run parallel to each other along the length of the bone. Each of these cylinders is called a Haversian system. Blood vessels and nerves run along the central canal of each Haversian system. Each system consists of concentric rings of bone material (the matrix) with minute spaces in it that hold the bone cells. The hard matrix contains crystals of calcium phosphate, calcium carbonate and magnesium salts with collagen fibres that make the bone stronger and somewhat flexible. Tiny canals connect the cells with each other and their blood supply (see diagram 6.14). The skeleton starts off in the foetus as either cartilage or fibrous connective tissue. Before birth and, sometimes for years after it, the cartilage is gradually replaced by bone. The long bones increase in length at the ends at an area known as the epiphyseal plate where new cartilage is laid down and then gradually converted to bone. 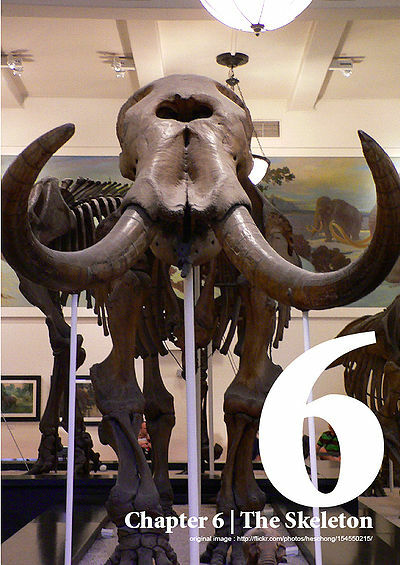 When an animal is mature, bone growth ceases and the epiphyseal plate converts into a fine epiphyseal line (see diagram 6.16). The shape of the articulating bones in a joint and the arrangement of ligaments determine the kind of movement made by the joint. Some joints only allow a to and from ‘gliding movement' e.g. between the ankle and wrist bones; the joints at the elbow, knee and fingers are hinge joints and allow movement in two dimensions and the axis vertebra pivots on the atlas vertebra. Ball and socket joints, like those at the shoulder and hip, allow the greatest range of movement. Different animals place different parts of the foot or forelimb on the ground when walking or running. Humans and bears put the whole surface of the foot on the ground when they walk. This is known as plantigrade locomotion. Dogs and cats walk on their toes (digitigrade locomotion) while horses and pigs walk on their “toenails” or hoofs. This is called unguligrade locomotion (see diagram 6.20). The skeleton maintains the shape of the body, protects internal organs and makes locomotion possible. The vertebrae support the body and protect the spinal cord. They consist of: cervical vertebrae in the neck, thoracic vertebrae in the chest region which articulate with the ribs, lumbar vertebrae in the loin region, sacral vertebrae fused to the pelvis to form the sacrum and tail or coccygeal vertebrae. The skull protects the brain and sense organs. The cranium forms a solid box enclosing the brain. The mandible forms the jaw. The forelimb consists of the humerus, radius, ulna, carpals, metacarpals and phalanges. It moves against or articulates with the scapula at the shoulder joint. The hindlimb consists of the femur, patella, tibia, fibula, tarsals, metatarsals and digits. It moves against or articulates with the pelvis at the hip joint. Bones articulate against each other at joints. Compact bone in the shaft of long bones gives them their strength. Spongy bone at the ends reduces weight. Bone growth occurs at the growth plate. 3. Where is the patella found? This page was last edited on 9 April 2019, at 14:03.